(a) Base - Base is a hollow casting upon which the other parts of the shaper are mounted. It also houses a reservoir for supply of oil which is circulated for moving parts of the machine. (b) Frame - Frame is a large casting that rests upon the base. It houses the mechanism and supports the ram and the table. (c) Ram - Ram is the main moving part of the shaper. It holds and drives the single point cutting tool back and forth across the work. This is attached to the rocker arm through a small link lever, and slides along the top ways. (d) Tool Head - The tool head is designed to hold the cutting tools. It is attached to the front of the ram. It may be swivelled to a required angle to the left or right with respect to vertical slide of tool head and locked in place with the help of a bolt or screw. It may also be adjusted vertically and locked in position. The tool post is fastened to a clapper box to ride over the work when the ram returns back. It is lifted upward to relieve the friction, which will prevent the tool cutting edge from dragging on the work-piece. This also prevents tool wear and poor finish. (e) Table - It is a metal box, which is attached to the frame of the shaper. It has “T” slots on the top and sides, which are used for clamping work or a vice on the table. It slides on the front side through a saddle. It is supported in the front by a bracket attached to the base which is called the out-board clamp. The table is often connected with a link lever and a ratchet from the rocker arm, which imparts the automatic movement when required. This automatic movement may be of definite amount during each return stroke of the ram. Though the table can be vertically fed to give a cut on some special occasions, but this method of feeding is not generally used since it is too laborious. Table is vertically moved only to accommodate jobs that vary considerably in heights. This type of table cannot be swivelled or turned. (f) Universal Table - A universal table is the one that can be operated in the same manner as a standard table. In addition, it may be swivelled to the left or right and if needed can be rotated to a full circle. A dial plate graduated in degree indicates the angular setting. The top surface may be tilted up to 15º forward or backward. (g) Table Support or Out Board Clamp - It gives an extra support to the table. 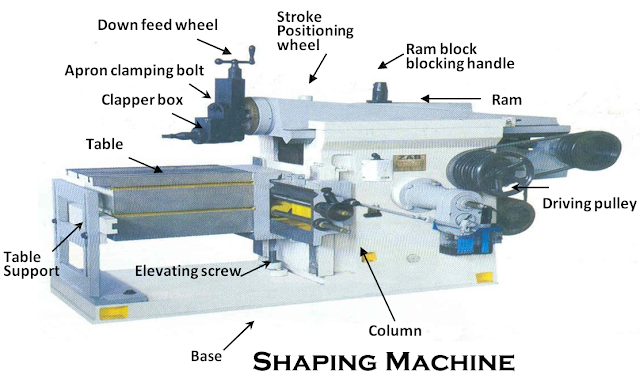 It is fitted on the front side of the machine to take up the cutting pressure as the tool cuts in forward motion. To lower or raise the table the clamping nuts of outboard support is to be loosened. (h) Pointer or Stroke Indicator - It indicates the length of stroke. When tightened, it clamps the ram where by the oscillating motion of the rocker arm is transferred to the ram through the link lever. If it is not clamped, movement of rocker arm will not be transferred to the ram. (i) Friction Quadrant or Automatic Movement of Vertical Tool - This mechanism is incorporated in heavy machines to impart automatic feed of the tool through the swivelling slide. (j) Small Link - This link is connected to one end of the rocker arm and the other end to the ram. The oscillating movement of rocker arm through the link is converted into the reciprocating motion of the ram. It is pivoted on the sides to give freedom of movement when the rocker arm moves forward and backward. (k) Rocker Arm or Long Link Lever - The rocker arm is pivoted at the bottom of the machine, which carries the sliding block in its slot. The rotary motion of the bull gear is converted into oscillating motion of the rocker arm through the crank block, crank pin, and sliding block. (l) Bull Gear - It is a big (generally helical) gear which carries the mechanism and is driven by a pinion. On the face of this bull gear, there is a dovetail way in which the crank block is held. (m) Sliding Block - The block is made of wear resisting metal. It is generally made out of bronze and slides in the slot of the rocker arm with up and down movement. (n) Elevating Screw - It is used for raising and lowering the table. (o) Stroke Adjustment Crank - Through this the stroke adjustment is done by offsetting the crank block from the centre of the bull gear to the required distance. (p) Clapper Box - It is hinged on the swivelling slide and carries the tool holder.